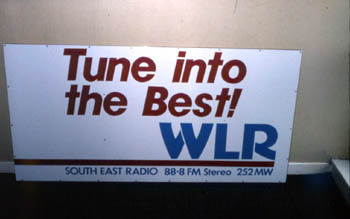 WLR used to be heard at night on their 1197 frequency. 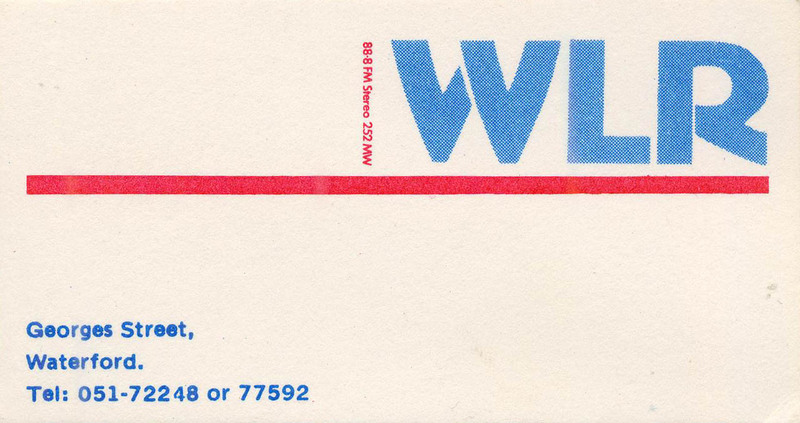 This was a channel used by the VOA in those days for the powerful transmitter in Munich, and must have caused some grief at night time. 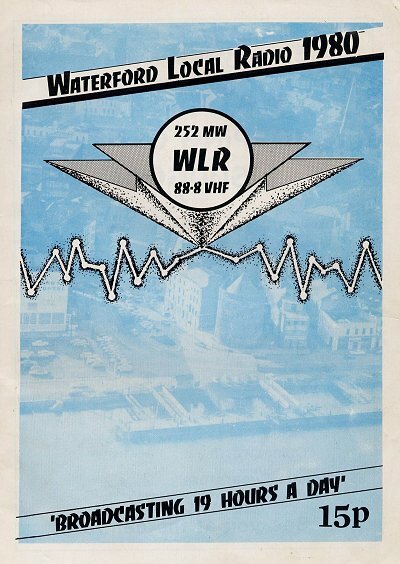 Telstar / NER from Dundalk also used the channel, and in 1981 when we were visiting Waterford, the MW was off air while the transmitter was being installed at a new tx site. 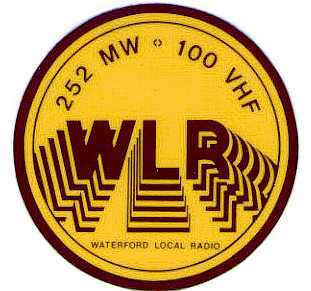 As a result, we have a rare recording of Telstar Radio from Dundalk on the WLR channel of 1197, recorded in Waterford!! 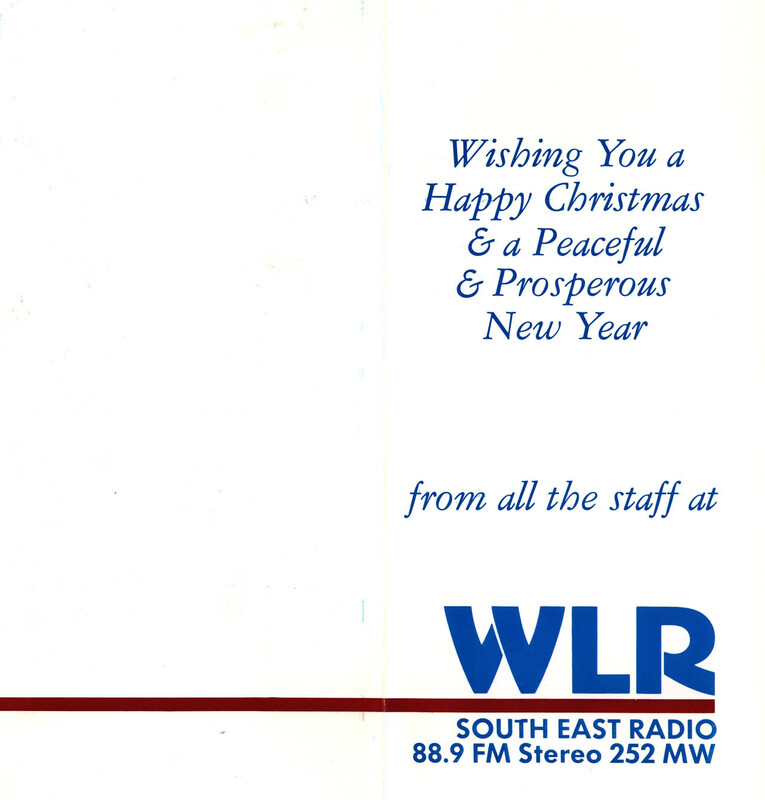 Right: The old WLR transmitter site, used up until the day we visited in August 1981. 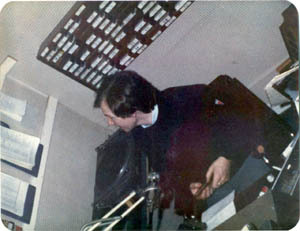 Rick Wheelan on WLR in April 1983, and below, the reception door. 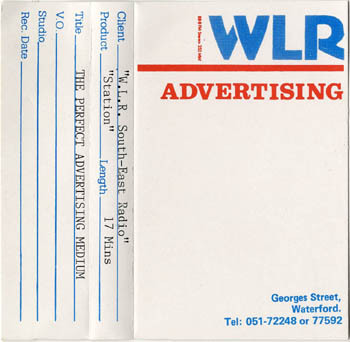 WLR advertising tape, approx 17m running time. This was given to potential advertisers to try and sell them ads. Right, the street entrance to WLR, with the old (perhaps more eye catching) logo. 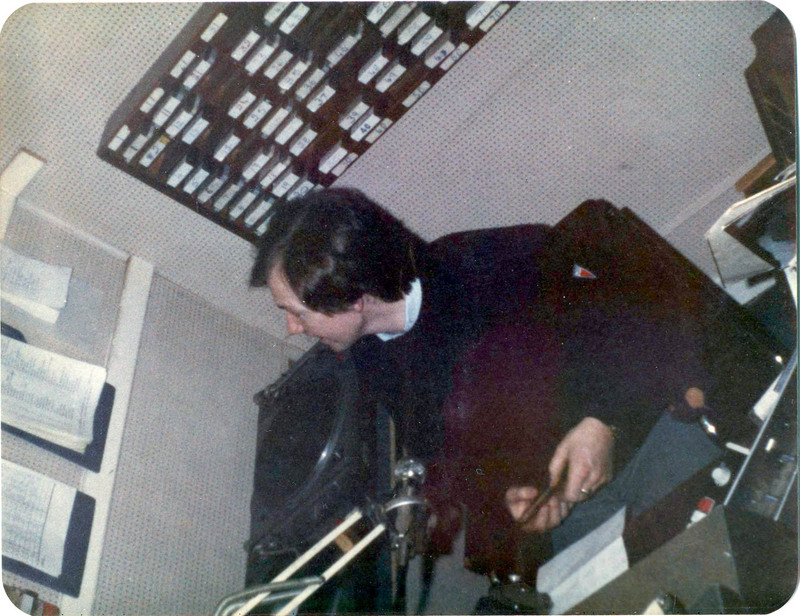 A notice board on the floor at the studios of WLR as seen on a visit to the station in 1986ish. Photo courtesy of Steve West. 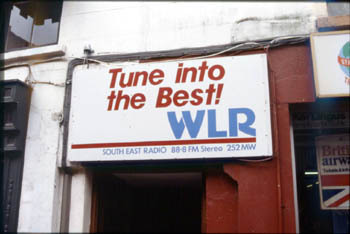 Right - WLR door from August 1988, taken by Steve West during his travels. The same sign that was on the floor in the studio in 1986, ready to be put up? A couple of studio photos of WLR from 1986, taken by Steve West during his travels. The left hand image is the main on air studio? 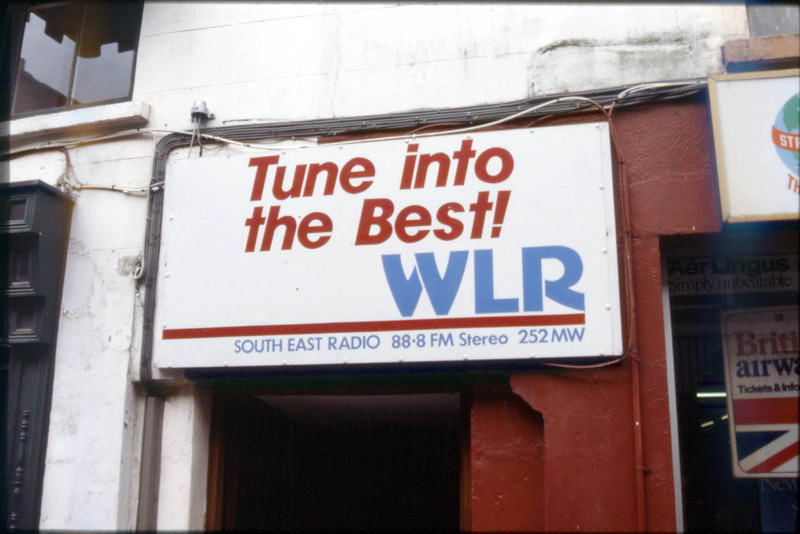 A couple of studio photos of WLR from August 1988, taken by Steve West during his travels. The left hand image is the main on air studio? Waterford Local Radio sticker from 1981, which has not been found recently to rescan at a decent res. 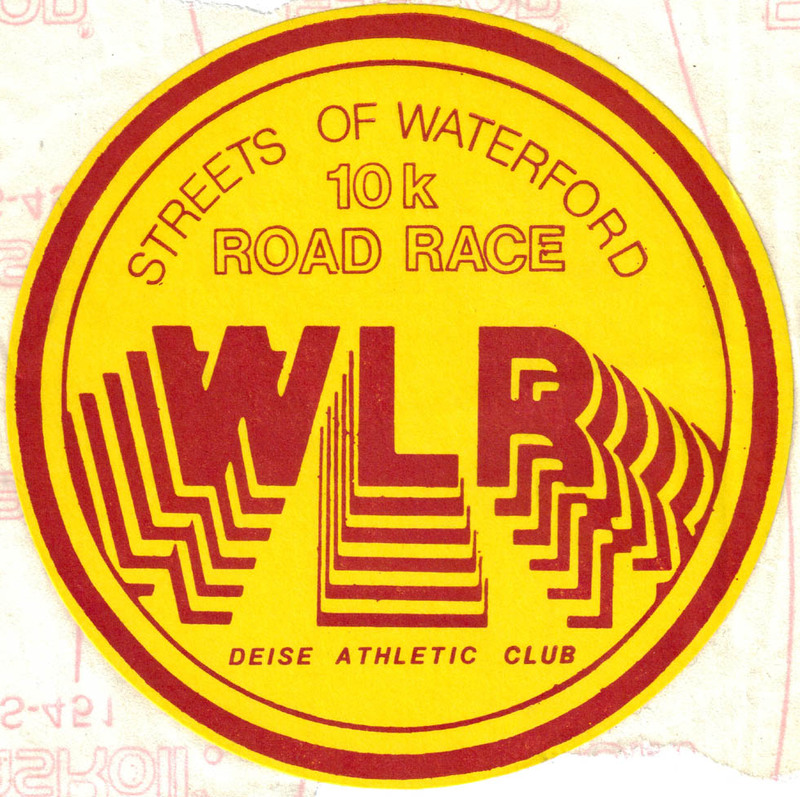 The image on the right from a 10k road race has the same old WLR logo. 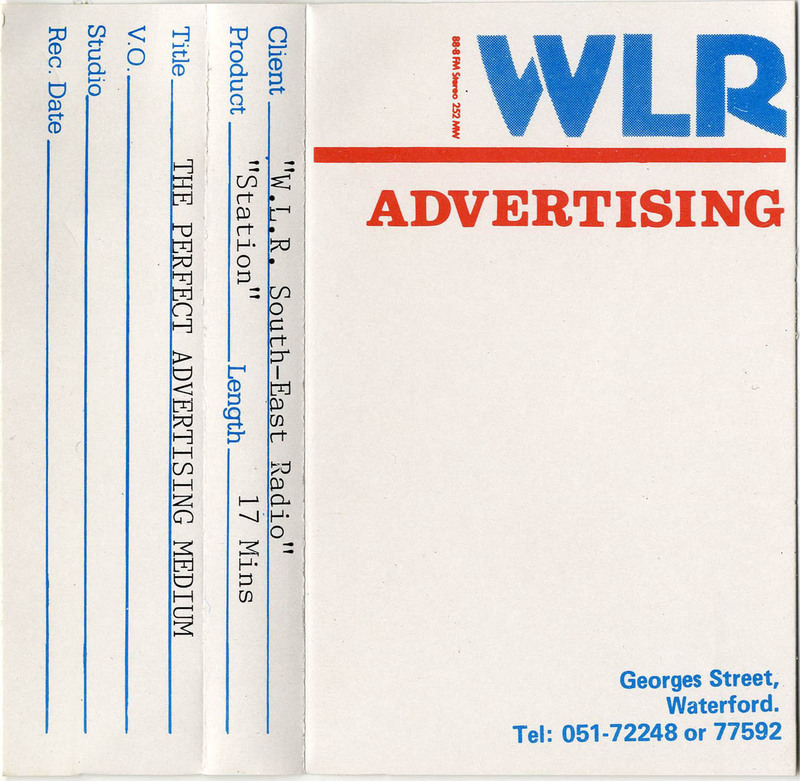 Some promotional matertial from WLR, a long car sticker, and a couple of compliments slips / cards from WLR. 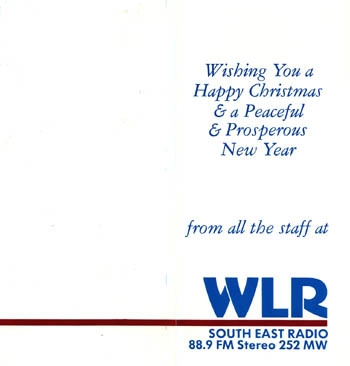 The WLR front page of their magazine from 1980. 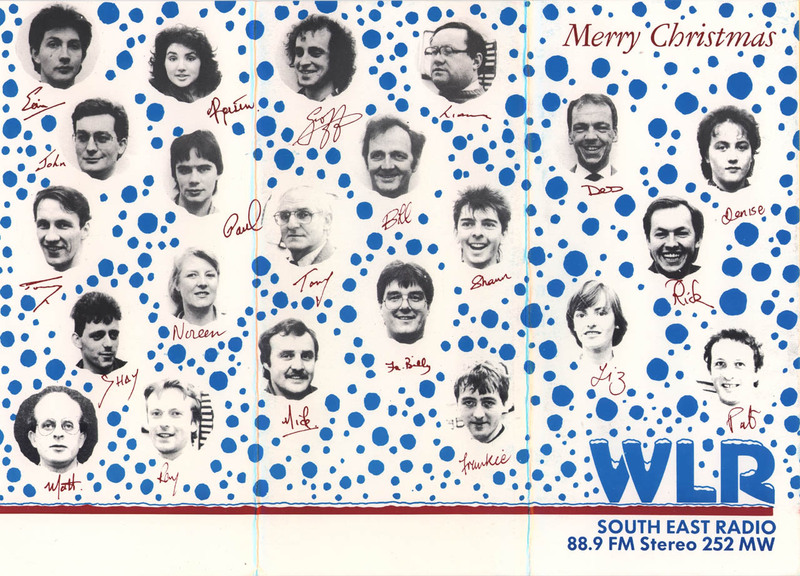 Ironically, the picture on the front cover shows very near to 7 The Mall, the Suirside Radio studio, their rival. The round tower thing, which from memory was the Reginald pub, or The Reginald was maybe next door or something.. 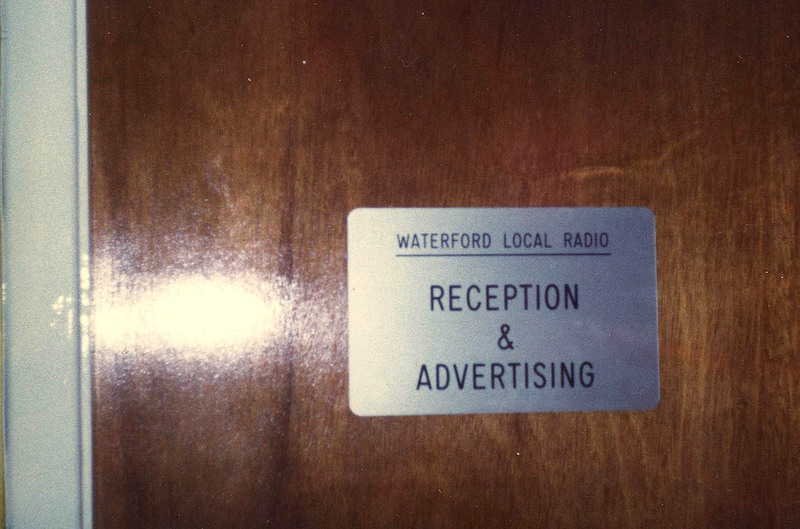 Although Waterford Local Radio's history technically began in June of 1978, the whole idea was hatched many years previously back in I972. 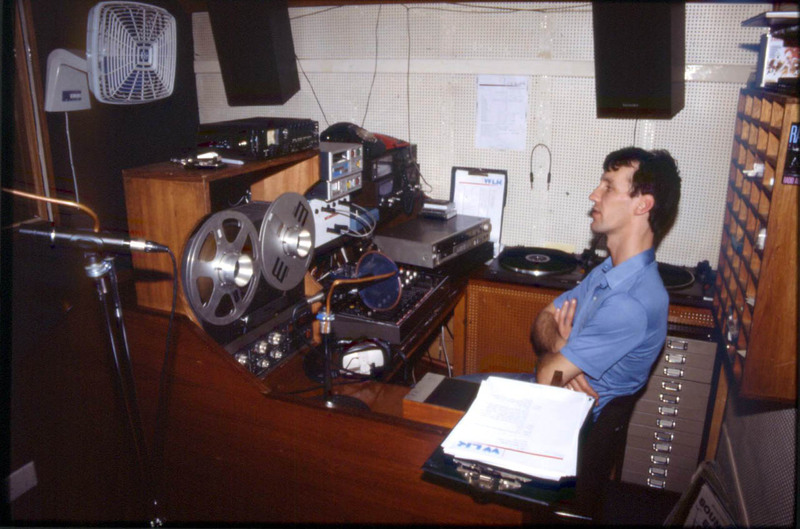 It was then that Rick Whelan and Egidio Giani broadcast on a tiny transmitter, the broadcasting range was only about a hundred yards but then it was a start. 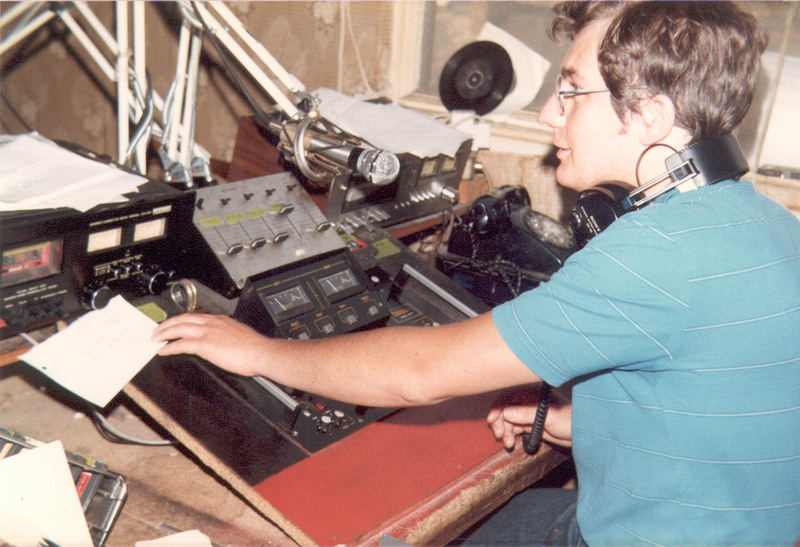 Rick always held onto his ambition of having a local radio station in Waterford and when he returned to Waterford in 1976 he immediately contacted Egidio and put his ideas to him. 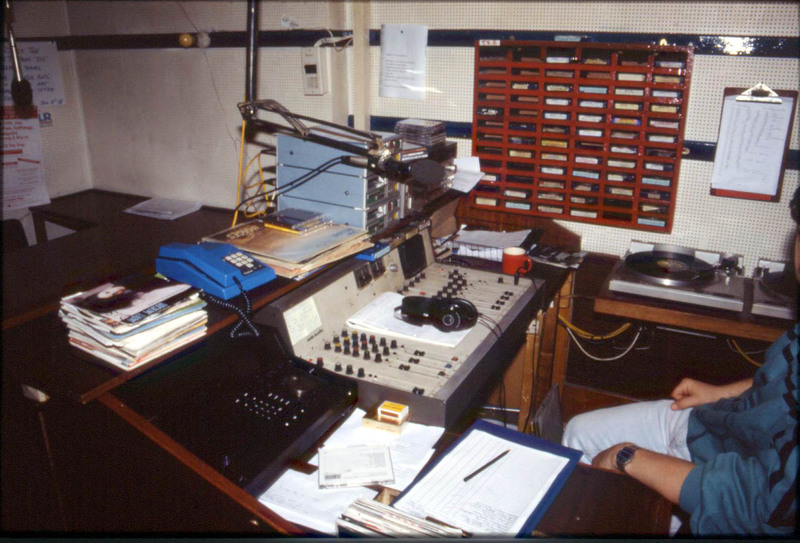 For over a year, Egidio worked on a transmitter that would give a quality signal and a reasonable range while Rick lobbied support from people interested in radio. 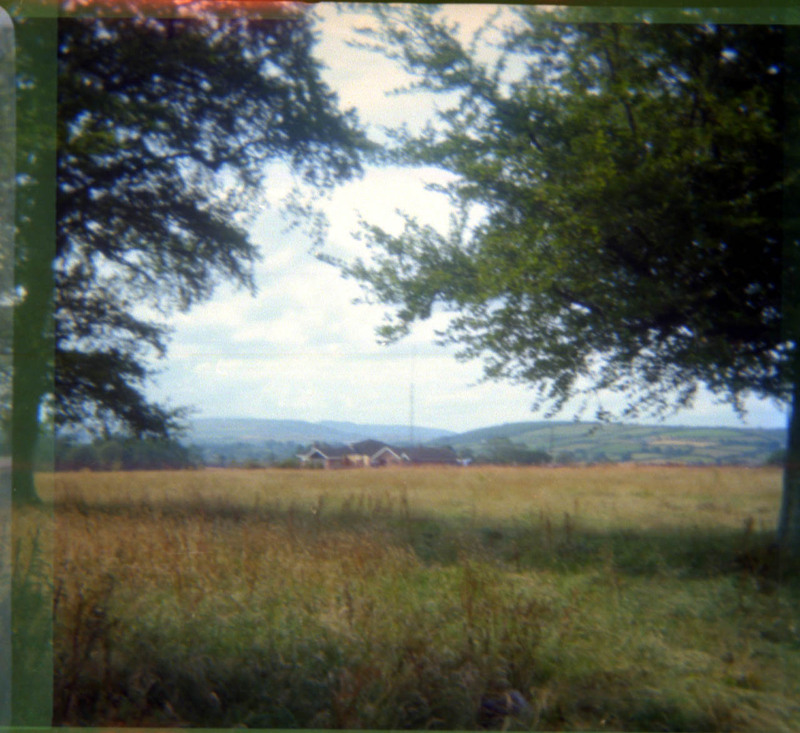 By May of 1978 the transmission tests were at last proving fruitful. Very few people hear of Egidio who is forever behind the scenes but his electrical genius is one of the most important contributions to WLR. Egidio is now a well known and highly regarded technician having built over twenty transmitters and supplying many to other local radios in Ireland. The fact that WLR is the only pirate station operating on V.H.F. 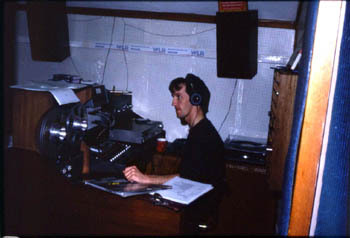 and Medium wave is testimony to his talent. W.L.R. Makes it's 1st official broadcast from Director Rick Whelan's garage in Butlerstown on Sunday 23rd. June. Reaction is extremely good and by the end of June we have five presenters and are broadcasting from ten in the morning until six in the evening. Our first advertising revenue starts to come in, so we then boost our transmitter, which now has a radius on medium wave of 20 miles. Five 0 in the Waterford Shopping Centre becomes our official supplier of records. W.L.R. is proving to be a huge novelty and we are delighted. More money is put into equipment. We are finding Rick's Garage a little restricting, so we move to a gate lodge down the road. Our Telephone arrives and rings constantly with requests, news items and lost and found. We are still broadcasting from ten until six. Our part-time staff now are Rick Whelan, Pat Haberlin, Ray O'Brien, Geoff Harris, Jackie O'Keeffe and Tom Mullane. Things are now getting more organised, so a meeting is called and its decided that we need news Bulletins and proper office organisation. Helen O'Brien joins as newsreader and we take on another girl for the office. We do our first interviews with people from Community Organisations and we are getting away from the 'All Music' idea. 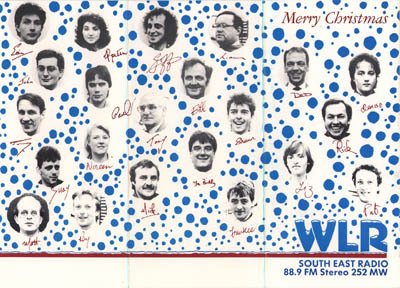 Des Whelan joins as Rock presenter. We are now receiving over 250 calls during broadcasting hours and it is time to appoint a full time manager. Des Whelan gets the vote and immediately extends broadcasting hours to 7.30. p.m. and makes out a regular weekly timetable. The station now starts broadcasting at 8.00 a.m. We start our own roadshow in the Ardree Hotel on Sunday nights. The average attendance over two years is 400. A contribution from each nights takings goes to the care of the aged in Waterford. The timetable is now stable, so our first community based programmes are introduced, including Saturday Morning Community Round-up, The Saturday afternoon local sports show, Hospital Requests programme and interviews are now featured daily. More Community groups are getting involved. We are raided at 7.l0 p.m. on Thursday 8th November by the P and T and our transmitter is confiscated. We install our spare transmitter and back on the air by 7.50.p.m. We start an appeal for Toys and Clothes for needy kids in Waterford. The response is incredible and we have a great Christmas. We introduce a 'Phone-in system and Waterford people living in England send greetings to friends and relatives over the air. We decide to extend broadcasting hours and are now on the air from 7.30 in the morning until 1.30.a.m. We introduce a Magazine type programme every morning between 11 and 12. The programme features local news; interviews with well known personalities and community groups. The show proves to be a great success. Jono Torrie is appointed Head of our Advertising Department. Our transmitter is again confiscated by the Department of P and T and we are treated much more informally this time. We all have a cup of tea and a chat. We were back broadcasting the next day after installing our new and more powerful medium wave transmitter. We introduce a special weekly two hour show for youth clubs in the locality. We also form a playlist committee for the selection of records to be played weekly. We introduce a singles and album chart based on sales and popularity. Our transmitter arrives, but our present location has not enough height. We introduce two bilingual programmes to the timetable. Martin Harte joins the ranks. Massive coverage is given to the N D C National Milk Run. 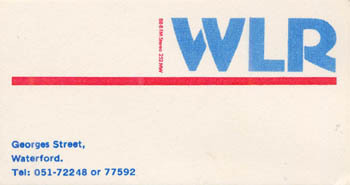 We celebrate our first year on the air with a live broadcast from the WLR Birthday party at the Ardree Hotel on Sunday night. Alleyn Pheasey does a marathon show of 10 hours The money raised goes to the St. Vincent de Paul. 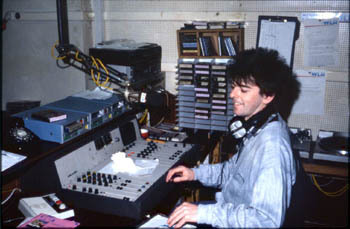 Tony Weldon takes over the Tea-Time Special which is now catering for an older audience. Sports results are introduced at 5.15 p.m. in the afternoon and at 10.15 each night. The station is still based in Butlerstown and we are now finding that to offer a better service we must move into Waterford City. The site we require has got to be (a) Central (b) Height in order to use our VHF transmitter (c) easy access and (d) spacious. We look at several premises. In the first week of September we see our present premises. It is just right, situated on one of the highest points in Waterford. It is also spacious and easily accessible. We move in on a Saturday in September and we are broadcasting from Wellington Street the following afternoon on VHF. We relay our VHF signal and put it out on medium wave from Butlerstown. Because of the VHF we are now being piped thoughout every shop, licensed premises and factory in the City. Reaction is terrific. 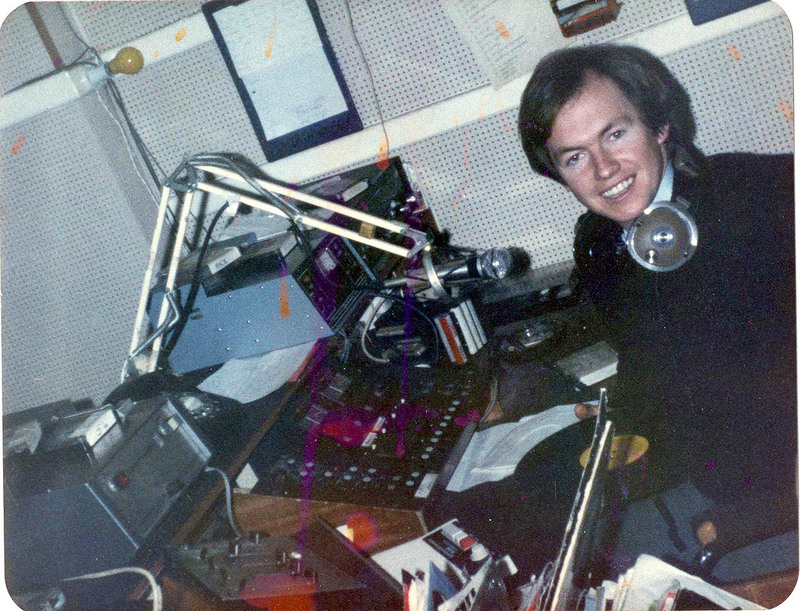 Geoff Harris returns from RTE 2 to WLR and presents his own programme daily from 4.p.m. to 6 p.m.
A survey carried out as part of a project by pupils at Saint Paul's Community School reveals that 76% of the people in the area listen to Waterford Local Radio. We again appeal for Toys and Clothes to the Community for the needy people in Waterford to help brighten up their Christmas. Reaction is fantastic, so much that we are still distributing toys and clothes almost two months later. Again we feature 'phone in from Waterford people living in England, this time for all of Christmas week. 'What's on this Weekend' is introduced to our Friday timetable. We decided to to a spot check on our listening Audience in central Waterford. 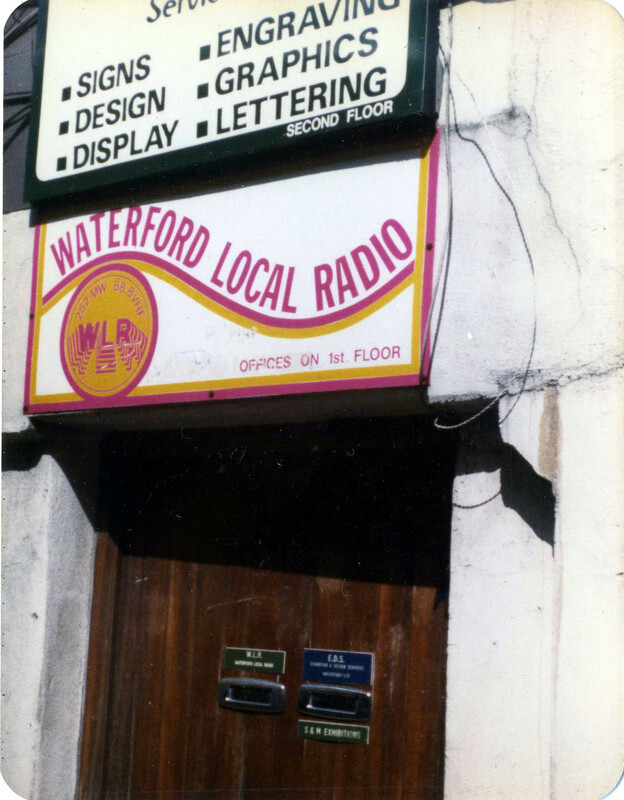 Out of 30 shops visited, 27 radios were tuned to WLR on medium wave and VHF 15 on VHF and 12 on Medium wave. Waterford Local Radio and Five 0 sponsor their own Rally car.